Send and receive text messages online using our bulk SMS platform. 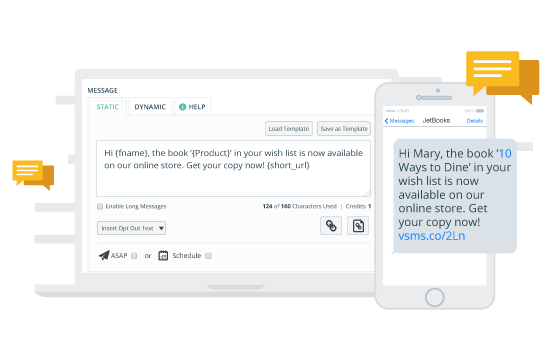 Voodoo SMS lets you send a text message to thousands of people at once and receive response messages online using our secure, affordable service. If you’d like to communicate with your customers or reach your target audience, SMS is one of the best channels you’ll find. Our service lets you send SMS online at an affordable rate, giving you the ability to effortlessly communicate with your target audience. At Voodoo SMS, we specialise in providing bulk SMS services to small businesses and large UK companies alike. Our pricing system lets you buy anywhere from one to over one million credits for sending and receiving texts, with bulk rates for large credit purchases. Why should your business use online SMS? SMS is one of the most effective channels for reaching your target customers. The vast majority of individuals within the UK have a mobile phone capable of sending and receiving SMS, giving SMS a level of coverage and effectiveness that’s unmatched by other marketing channels. When your business uses email marketing to reach its target audience, many of your messages will be deleted before they even reach the prospect’s invoice. SMS messages lets you get your target audience’s attention through a widely used channel at an affordable cost. Our user-friendly system lets you start sending text messages online in minutes, even if you’re not a developer or “technical” person. Just create and fund your free account to start reaching your target audience via SMS today. Sending your first text message using Voodoo SMS is simple. After creating your account, all you need to do is add a contact list of people who will receive your text messages, add your sender ID and prepare your first text message. You can schedule your online SMS to be broadcast immediately, or you can choose a specific time and date. You can even use our system to send texts in specific blocks at a specific time interval, giving you total control over the response to your campaign. You can also receive text messages online using our system. Create a keyword using our short code number (88440) to receive text messages online from your target audience and grow your contact list quickly. If you already have a long number, you can use it to receive SMS using Voodoo SMS. This lets your customers communicate with your business directly, with each number securely stored in your account as a new contact. With API access, connecting our online SMS platform with your application is a quick and simple process. Create your Voodoo SMS account now and start sending SMS online from just 1.74p per credit. Our user friendly platform and great bulk messaging rates make us your reliable partner for online SMS in the UK.